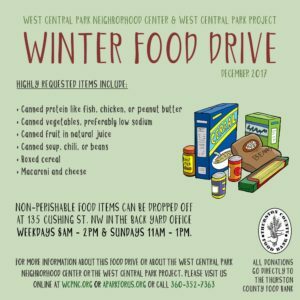 The West Central Park Neighborhood Center and West Central Park Project are teaming up to help feed our community this coming winter. During the month of December, we will be collecting non-perishable food donations for the Thurston County Food Bank. Donations can be brought to the park office, located in the back yard at 135 Cushing, weekdays from 8am to 2pm or during Sunday work parties between 11am and 1pm. Please make sure food donations are not expired and non-perishable. All donations go directly to the Thurston County Food Bank. For More Information about this food drive please email us at hello@wcpnc.org or call 360-352-7363. Previous PostHit the Ground Digging!